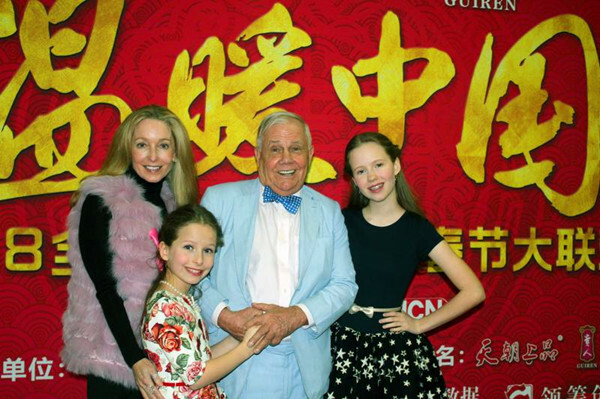 World-renowned investor Jim Rogers made the decision to have his two daughters instructed in Chinese language and culture because he has long believed China would be the most important country of the 21st century. Happy and Bee, or "the daughters of Jim Rogers," at the ages of 14 and 10 are already set to one day turn the tables of fame on their father, who may come to be known as "the daddy of Happy and Bee Rogers." The pair of vivacious and outgoing sisters were with their parents in Beijing in January to take part in a filming for a Spring Festival gala to benefit China’s “left-behind children.” The Rogers family also set up a trust for left-behind children last year at a Baima Primary School in Shandong Province to award excellent bilingual students. In recent years, the girls have gained internet starlet status ever since videos of them speaking fluent and accent-free Mandarin went viral, rivaling U.S. President Donald Trump's Chinese-speaking granddaughter Arabella. "Hello, Chinese directors, I'm Happy Rogers, come and cast me and my sister in your films," said the elder sister Happy during a recent interview with China.org.cn, speaking into the camera as if doing an audition video. Happy’s dream is to be an actress, especially in China. "I felt if I went to Hollywood, I would be just another girl there,” she said. “But in China, I can speak Chinese, so it would be different and special." She said she would also like to be a hostess for China's most widely viewed Spring Festival Gala in the future. During the interview, the duo recited Tang Dynasty poetry by Li Bai as well as a Chinese tongue twister and sang a Chinese song. They also revealed that they “super love” xiaolongbao (dumplings), qipao (cheongsam), giant pandas, the classic novel "Journey to the West" and other uniquely Chinese cultural and historical features. Ten-year-old Bee shares the same dream of becoming an actress with her older sister; but she also wants to be Queen of England and even has her own agenda for the first 100 days. "I want to be Queen because I want to help those who are in need," she said in Chinese. Both sisters also showed their promise as budding feminists, saying they would love to support the #MeToo movement that has mushroomed on social media since October 2017, to help fight widespread sexual harassment in Hollywood and other workplaces. Happy added that they even corrected a verse in a traditional Chinese children's song that says, "Dad goes out to make money and Mom takes cares of family." "We changed it to 'Mom goes out to make money and Dad takes cares of family at home,'" said Happy, explaining, "We felt we cannot sing the original lyrics like that. We want to make it that men and women are equal. We want to make women have more opportunities." The cultured businessman and financial commentator was clearly proud and enjoyed the moment. He smiled throughout the interview as his daughter answered questions, though he could not understand most of what they said. "We say our little secrets in Chinese, as my dad doesn’t understand the language," whispered Happy. But the eldest Rogers, at 75, does know one Chinese word, which is his favorite according to his daughters: "weiji" (危机，normally meaning "crisis"). "In Chinese, it means disaster and opportunity are the same thing," Rogers explained, "but we don't have that word in English. China has been around for thousands of years, so you know about weiji. When you see problems, remember weiji." Rogers’ emphasis on this word illustrates his conviction that despite some doubts and fears that have accompanied China's rise in the world and some problems that still lie ahead, "China is going to be the most important country in the 21st century. " That is why he began in the late 1990s to make monetary investments in China, and made the decision to have his daughters grow up in a Chinese environment. "I wrote, lectured and broadcast that people, everybody, should teach their children and grandchildren Mandarin. And when she came," he said, pointing to Happy, "I immediately got a Chinese governess to come and live with us in New York." Later he moved his family from the United States to Singapore, in part to give his daughters access to a Chinese environment and let them experience both Asian and Western cultures. Jim Rogers himself visited China as a tourist many times since 1984, including making a motorcycle tour of the vast country in 1988, from Shanghai all the way to Pakistan. These experiences contributed to his growing vision of China’s future. "In my travel across China in the 80s, I realized that China would be the next great country in the world," he said. "China is on the rise again." Rogers is a successful investor, but as a father he has not yet taught his girls about investment. "I would only teach them when they are willing to learn," he said, though he wants them to gain a taste for working and making money in their early years. "I told them that life is not easy, you must save money, have a job and learn to work." Happy and Bee Rogers have paid attention. Happy now teaches Chinese to two younger girls in Singapore, earning US$25 an hour, while Bee works as a babysitter and Chinese tutor for two younger boys. "They were smarter than I," Rogers said of his daughters. "I once thought they would go to McDonald's and get a job, making US$7 or $8 an hour." Jim Rogers has also left other legacies for his children, including a book he wrote called "A Gift to My Children: A Father's Lessons for Life and Investing." In it he shared what he wants his daughters to know, including how to learn from his success and mistakes. "Look out the window; it is a completely different country from what I saw in 1984," Rogers said. "China changes every day, every week, every month and every year." He paused and gazed at his daughters, as if already envisioning them on the wide-open stage that lies waiting for them to shine in every way in the future China. World-renowned investor Jim Rogers had his two daughters well taught in Chinese culture, owing to his long-standing belief that China would be the most important country of the 21st century.